Smart home tech is the hot new thing, but it can be pretty overwhelming if you’re just getting your feet wet. 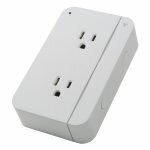 For newbies, it makes sense to start with something simple, and it doesn’t get any simpler than the humble smart plug. These cheap, compact devices plug into traditional wall sockets, upgrading them with remote control, scheduling, and power usage monitoring via smartphone apps. And if you’re already on the smart home bandwagon, you can even integrate them into your Apple HomeKit, Amazon Alexa, or Nest–driven ecosystem. 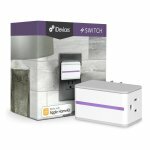 If you’re looking for a smart plug that hits all the right notes and never puts a foot wrong, the iDevices Switch is the way to go. On top of Android and iOS compatibility, the Switch also offers in-depth energy monitoring and seamless integration with the two most popular smart home ecosystems: Amazon Alexa and Apple HomeKit. Looks aren’t everything, but the iDevices Switch is also easily the most attractive smart plug we tested. Along with its sleek, minimalist casing, it offers a unique “night light” LED strip that can be set to any color in the rainbow. Mercifully, the Switch only occupies a single outlet on your wall panel, and its own outlet is positioned on the right-hand side—a real advantage if you want to position it snugly behind a couch or bookcase. It could also be a disadvantage if you want to plug something in on the left side, but for most users it shouldn’t be an issue. The slickly designed iDevices app is more attractive than most, and very easy to use. We never lost connection to the plug during our testing period, and even when we unplugged it and moved it to another room, the Switch was always quick to regain a WiFi connection. When we were out of the house, the remote control function made it easy to adjust schedules or turn the switch on and off. Energy monitoring functionality is robustly detailed, with daily, weekly, monthly, and yearly cost and usage estimates in addition to live power draw info. 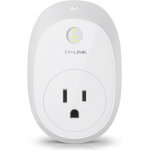 The TP-Link Smart Wi-Fi Plug with Energy Monitoring is a lot more elegant than its cumbersome name suggests. Though it’s not the smallest plug we tested, or the most feature-packed, it offers a stellar combination of features and low, low price. Its MSRP of $39.99 is the second-lowest among all the plugs we tested, but its energy monitoring functionality, responsiveness, reliability, Alexa integration, and well-designed app made it one of our favorites overall. We’re not the only ones who like it, either—it’s Amazon’s #1 best-selling smart plug. Installation was blissfully easy on our Android and iOS devices via the intuitive Kasa app, which holds your hand through the entire process. During our long-term testing, the TP-Link Smart Plug never lost its connection to our WiFi network, and the handy Remote Control feature lets you easily control your plug even when you’re away from home. There’s even a clever “Away” mode that turns your lights on and off at random to make potential burglars think you’re home when you’re not. Still, the TP-Link Smart Plug isn’t without its quirks. Most notably, it will block the top socket if you plug it into the bottom one, and even when plugged into the top socket it might get in the way of larger plugs you try to cram in below. Your typical two-pronger will probably fit fine, but forget about trying to squeeze a power brick in alongside this thing. Like its bigger brother, the Smart Plug Mini enjoys easy setup on iOS and Android, a great mobile app, convenient remote control, integration with Amazon Alexa, and neat extra features like the aforementioned Away Mode. Unlike its sibling, however, it only covers a single outlet regardless of where you position it. It’s one of the smallest plugs we tested, making it a great choice for buyers who don’t have a lot of space. Unfortunately, it also costs more than the Smart Plug with Energy Monitoring and, well, doesn’t offer energy monitoring. In other words, you need to be really concerned about space to choose it over the slightly larger alternatives from TP-Link and iDevices. Price and features aside, this plug is every bit as solid a performer as its stablemate: we had no issues with connectivity during the testing period, and it was very responsive to commands on both iOS and Android devices. If you find it on deep discount and don’t need energy monitoring functionality, it’s a very good choice. 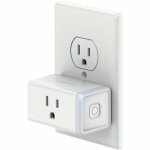 The ConnectSense Smart Outlet sticks out for a couple obvious reasons. First, it’s huge—no matter where you plug it in, this power brick–sized behemoth will cover both outlets on a wall panel. But that’s okay because it’s also the only product we tested that offers two independent smart outlets. That’s really handy and pretty cost-effective since the Smart Outlet costs around $60, or $30 per outlet—cheaper than any other option in our test group. It works well, too. The outlets are responsive to app commands, connectivity was solid, and HomeKit integration was easy to set up. There’s even a bonus USB port on the left-hand side for charging extra devices. (You don’t get power monitoring on that one, though.) Speaking of power monitoring, we found that this plug’s reporting differed quite a lot from others we tested. For instance, it showed a draw of 36W from a small fan on low, while other plugs reported usage in the 25-27W range. The ConnectSense Smart Outlet also has some serious drawbacks. For one thing, it’s iOS-exclusive. For another, its app is among the clunkiest we tested. It works, but it’s not much fun to use. And in addition to its potential unreliability, the energy monitoring functionality isn’t as feature-rich as you’d get from competitors like iDevices, TP-Link, and Elgato. On paper, the Belkin Wemo Insight ought to be a strong contender for the best smart plug on the market. Not only does it offer power monitoring and a huge array of smart home integrations (including Alexa, Nest, Google Home, SmartThings, and IFTTT), but it has a sleek design and endorsements from respectable publications. Unfortunately, setup was a notable pain point on Android, and the Wemo app was a tedious chore to use—especially compared to the slickly designed apps from some rivals. 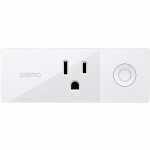 Like the Elgato Eve Energy and D-Link plugs below, the Wemo Insight also has a rounded design that blocks both wall outlets if you don’t plug it into the right one. 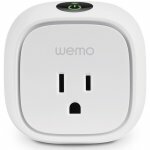 Functionality was just fine in general, and we couldn’t fault the plug’s reliability, but the Wemo app needs work. The Elgato Eve Energy is a cute little plug, with gently rounded corners and a glowing LED button on the front. Unlike the bar-style smart plugs we tested, it blocks your second wall outlet if you position it incorrectly—make sure to plug it into the bottom socket to avoid a conflict. 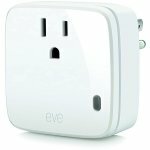 Like all of the other HomeKit plugs we tested (iDevices Switch aside), it’s iOS-exclusive, so Android users need not apply. The Elgato app is well-designed (with unusually in-depth power monitoring stats), but not as user-friendly as iDevices’. The plug itself is responsive and reliable, but it just doesn’t have enough to stand out in a very competitive market. The WeMo Mini is exactly what you’d expect from the name: a smaller version of the WeMo Insight, without the Insight’s power monitoring functionality. On the plus side, it’s a well-made device, and very skinny so that you shouldn’t have any issues with it blocking a second plug. It also has the lowest MSRP of all the plugs we tested. But on the downside, it has all of the same disadvantages as the Insight and fewer features. We’d pass, unless the WeMo app somehow tickles your fancy. Newer PostWhat is Blockchain Technology?